Plenty of out-of-the-box thinking went into naval architect Bill Shaw's design of the Pearson 30, from its encapsulated fin keel that dispensed with worry over rusting keelbolts to a scimitar-shaped spade rudder. Although most any boat will find its critics, the P-30 seemingly has relatively few, and a large share of the more than 1,100 hulls produced in Portsmouth, Rhode Island, between 1971 and 1981 are still sailing. The earliest of these production boats are now more than 40 years old, yet they still turn heads on the water. Much of the P-30's style is due to its narrow beam, which at 9 feet 6 inches, falls well within the aesthetically pleasing 3-to-1 length-to-width ratio for traditional yachts. In other words, this is no plump duck. Introduced in the wake of two successful Pearson racer-cruiser classics-the Triton and the Alberg 35-the P-30 was designed to accelerate in light winds for exhilarating around-the-buoys racing and to get cruisers comfortably to their destination at just over 6 knots. Built to last, the P-30 holds wide appeal among both coastal cruisers and racers. With a bulletproof hull and robust deck hardware, many owners focus their upgrades on replacing the Atomic 4 gasoline engine with a diesel, converting the pressurized galley stove to non-pressurized, installing a Y-valve and waste holding tank, a hot water tank with shower faucet, self-tailing winches, rope clutches, traveler, boom vang, and reconstructing the mast compression post. Finding a suitable location for the traveler requires compromising cockpit comfort. The same goes for other modern conveniences. Owner Jeff Griglack found room for a holding tank under the V-berth, but more owners choose the bottom of the hanging locker, space he did not want to sacrifice. New Englander Robert Franklin has owned two P-30s. "It's an attractive boat, sails beautifully, and it's comfortable down below if your orientation is to have an indulged camping-out experience," he said. "For the type of sailing most people do, compared to what most people dream, it's the perfect boat." Some critics contend the long tiller is necessary to compensate for imbalance purportedly caused by the rudder shape. Franklin quips the tiller seems too long only if you have too many people on the boat. For Bob Maxwell, owner of a P-30 in Salem, Massachusetts, the long tiller allows him to sit just about anywhere in the cockpit, especially beneath the dodger in foul weather. "It can be a shin knocker when making substantial changes in direction, but otherwise, it's not an issue," he said. "I've seen P-30s with wheels, but I would never do it." As for the troublesome Delrin bushings, Franklin contends if they are properly installed and maintained, they will last longer than expected. The earliest P-30s had aluminum rudder posts, but Pearson later substituted stainless posts and replaced the aluminum models at no cost to owners. Keeping the tiller tied off at a mooring or dock reduces wear on the bushings. The P-30's angular hull is eye-catching perched on jackstands in the boatyard, but her beauty is even more impressive under sail. The boat exudes quality. Give the P-30 hull a hard rap and your hand will ache but no drum sounds will reverberate. Anyone in the market for a vintage racer-cruiser will undoubtedly cross paths with the P-30, since there are plenty for sale. P-30s not upgraded will lack deck-top basics like a traveler and boom vang. The original mainsheet setup includes a double-block at the end of the boom and a single block to ether side of the cockpit, not always adequate to control a wind-filled mainsail in heavy seas. Construction of the P-30 went above and beyond, resulting in a boat seldom plagued by rot or delamination. The hand-laid, solid-glass hull reflected Pearson's opinion that cored hulls would ultimately be prone to leakage. The hull-and-deck joint is fastened with an external flange, glassed over and further secured with a generous quantity of stainless screws. The deck is balsa core sandwiched between fiberglass. The keel, with its lead ballast, is fully encapsulated into the fiberglass hull and coated with resin, so no keel bolts are required. The scimitar-shaped spade rudder relies on an integrated stainless tube that functions as a post. The Delrin bushings tend to wear out faster than most owners would like. The few problems common problems in the P-30 are easy to spot, especially the oak compression post at the base of the mast. A wooden wedge and fiberglass tab hold the post in place. The wedge tends to rot because it sits in bilge water. However, the damaged part can be easily replaced. Also inspect the wooden spreaders on earlier models for wear. Potential buyers should also examine the balsa-cored deck for wetness or soft spots, and the chainplates for potential leaks. Stanchions and chainplates loosened over time tend to weep moisture, ultimately creating problems unless refastened and caulked. The engine should be examined for obvious leaks, worn belts, cracked metal, ruptured fuel lines and given a compression test. Check the rubber flex connection between the fuel filter and the engine for wear. Also check for oil in the bilge, which could indicate a leak. The P-30 features high-quality, oversized deck hardware. The standing rigging is strong and includes a roller furler for the headsail. The cockpit is 7 feet 6 inches long and easily seats four, although complaints arise about the long-handled tiller and the low-mounted boom. The top of the aluminum mast is just over 42 feet from the water line, which means no hassles getting beneath most fixed highway bridges. The low-mounted boom makes standing in the cockpit an ever present danger. The saloon features 5-foot 10-inch standing headroom, with 6 feet 1 inch beneath the companionway hatch. African Iroko and other rare woods on the bulkheads, table and handrails lend a warm aesthetic. The galley comes equipped with pressurized alcohol stove, icebox, stainless steel sink, and a dinette that easily converts to additional berths. Some owners complain the sink is located too close to the companionway steps. The boat sleep six-two in the forward V-berth, two on the port side dinette, and one each in the port and starboard quarter berths. The port settee easily converts to a double berth. Storage compartments and lockers are plentiful. There's a private head but no shower. The boat holds 20 gallons of fuel and 22 gallons of fresh water, both adequate for coastal cruising. The Monel fuel tank holds up well over time. P-30s came equipped with a 30-horsepower Atomic 4 gasoline engine. Some owners prefer them to diesel, but at 40 years old these engines could be reaching the end of usefulness. The P-30 generates few complaints in terms of overall handling. However, debate continues over whether it's a bluewater boat. Considering its tender characteristics in heavy seas, it might not withstand an ocean crossing, although some owners report sailing to Bermuda without problems. As Franklin tells it, "In anything over 12 knots, you reef the main and use the 120-percent jib. It will still be balanced with no pressure on the helm. You just don't want to over canvas it. The boat is fast and responsive, manageable and maintainable. It's a terrific boat, the best I've owned," he said. Maxwell says the P-30 is highly maneuverable, but adds, "To offset that, not particularly directionally stable. Easy to hold a course with a light hand on the tiller, but won't hold course very long if you let go." The Pearson 30 is a rock-solid fiberglass racer-cruiser with unique construction features such as an integrated rather than bolted-on keel, which means less maintenance. Built of high quality materials, with a few key upgrades this classic sloop should provide years of enjoyment and excitement at an affordable price. PRICE: A used P-30 can be found for between $5,000 and $19,000, depending on the year of construction, overall condition and amount of upgrades. DESIGN QUALITY: The boat's scimitar-shaped rudder and soft bushings have their detractors, but overall the P-30 stays in the winner's circle, especially its encapsulated hull that has no keel bolts and little maintenance. CONSTRUCTION QUALITY: Born in the days when fiberglass boats were typically overbuilt, the P-30 is no exception. The hull is solid, the deck hardware and standing rigging super strong. USER-FRIENDLINESS: The P-30 has a simple sailplan and easy onboard systems. It requires early reefing. It is easy to handle in a light breeze and a comfortable racer-cruiser despite the annoyance of a long tiller handle. The engine is accessible by lifting the companionway steps, but the oil dipstick is located on the back side and difficult to reach. The boat has a head but no shower. SAFETY: Like most racer-cruisers, it's a compromise design and should be reefed early and often. Upgrades such as a vang or traveler can help tame the relatively long boom. TYPICAL CONDITION: Used P-30s run the gamut from pristine to project boat, but the vast majority offer a solid hull, sound deck and reliable standing rigging. REFITTING: Of all needed improvements, most later owners seem to target the Atomic 4 for replacement by a diesel. This is likely the most expensive undertaking for a refit, followed by attention to the rudder post and to the compression post where the mast steps onto the keel. The latter is mostly labor since a new compression post can be easily fashioned. Since no sewage discharge laws were in effect when the P-30 was made, the head must be updated with a Y-valve and a waste holding tank in most waters. Many owners added a boom vang and a traveler to make sailing in big winds a bit easier. SUPPORT: An active group of P-30 owners can be found online at the Pearson Sailing Association of the Chesapeake Bay at the website www.cbpsa.org. 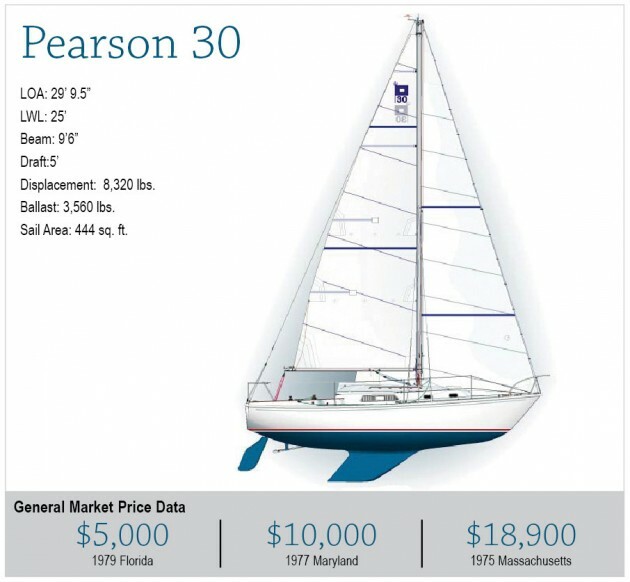 Additional information on the P-30 is available at www.sailboatdata.com and on blogs posted by specific P-30 owners. AVAILABILITY: Plenty of P-30s are available on both the East and West coasts of the U.S., in Florida, Texas, the Great Lakes and Canada. INVESTMENT AND RESALE: Depending the degree of upkeep and overall condition, the P-30 can be a sound investment. Most owners do not consider the P-30 a bluewater boat so its value is limited to coastal cruising.